Got my last drain out yesterday, and boy, does my arm feel better. Don’t get me wrong. It still hurts like crazy, but I’ve been able to cut back on the ibuprofen (which I’m sure my stomach is thanking me for) and my range of motion has improved a ton. I went in today for the ultrasound of my thyroid and yes, I have nodules. Woo. Most women my age do, especially with a hypothyroid history. They will take a look at them and if they are big enough, there will be yet another biopsy. Woo. So here’s the thing. I could really use a test with nothing suspicious on it so let’s get a big internet wide prayer/energy/good thoughts to NO THYROID CANCER. I think I’ve been kicked enough, you know? No more kicking. On a positive note, it is BEAUTIFUL outside and I think I might go talk a walk since I’m no longer burdened by drains. So does anyone know what PET stands for? People keep asking me and although I’m beginning to sound like a medical professional when I talk, I have no idea. Anyway. No metastatic disease. Hooray! BUT. Why is there always a but? I swear. There is something funky going on around the thyroid. Hopefully it is just my hypothyroidism which I’ve had since L was born. So I guess that makes it just a Hoo. Genetic testing was cancelled on their end and will be rescheduled soon. Second drain is to come out tomorrow. AND now I have an ultrasound on Friday to check out said thyroid. I’m doing my best not to go to the dark place. My Other Mama (My friend’s mom who has known me since I was 4 and also breast cancer survivor) always says, focus on the now and take each day as it comes. So I’m trying. 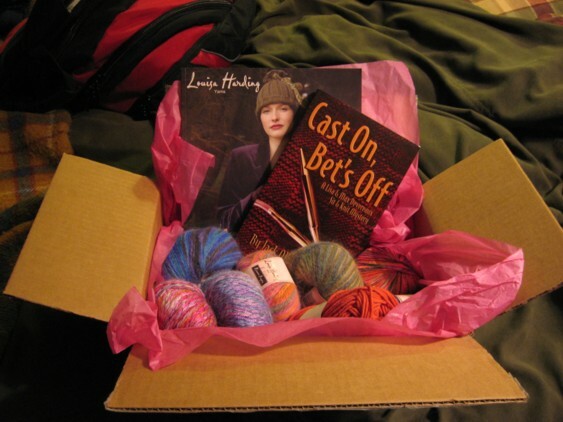 And helping me with that is another visit from the Yarn Fairy, who this time comes in the form of Sylvia who not only gave me some lovely yarn and patterns for hats (which I’m going to need in a few weeks) but a signed copy of a knitting trashy novel. How can one not be excited about a trashy novel in which the murder weapon is a pair of size 19 Addi Turbos? Thanks so much Sylvia, it was so great to see you today and all the other Tenn Street Ladies. I spent a lot of my high school career singing the National Anthem at just about every sporting event offered. A friend of mine sent me this and although I have all sorts of music teachery reservations about young people belting, I have to admit they’re pretty good. Very young to be able to hold harmonies like that. Got up this morning at 4:30 ish for my PET scan. As far as nuclear tests go, this one’s not to bad. They inject you with a radioactive sugar and you get to sit and watch a movie for an hour. Only bad part about that is now I need to rent Bridget Jones 2 so I can see the end. I did read the book though. Anyway, then you have to lie on your back on yet another very skinny platform while a circular machine whirs about your body. After that it was off to the surgeons where they were able to remove one of my drains but not both. I’ve been having some problems with what feels like super tight muscles in my shoulder/clavicle area and the nurse told it me it’s probably caused my the drain that had to stay in. Bummer. So it’s back to the surgeon’s on Thursday afternoon to get the other one out. Hopefully. They’re getting kind of gross as my body is trying to heal around them. Thursday morning I’m off to Porter to do some genetic counseling. It’s a yarny day, Mama! is what my 5 year old exclaimed as I came back from my outing to Knit Knack today. Cathy was kind to drive me as I was going a wee bit stir crazy here at the homestead. 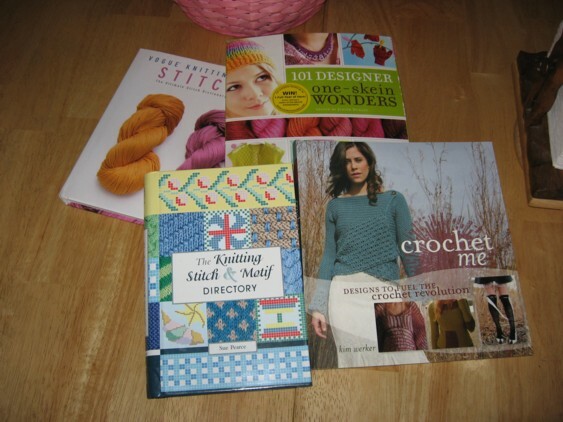 The lovely ladies from the Arvada Knitters, Knit Knack and I believe Posh as well, got together to make sure I have plenty to keep me busy during the chemo. Mary-Kay even dyed some special for me. There were stitch markers by Claudia and one of Ruth’s clever crochet hooks. 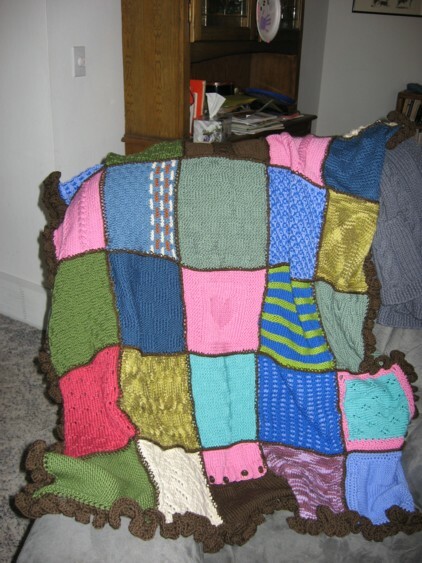 Also, they made sure I have a snugly afghan too! And there are two on the way for the kids! Books, books, books! Some of them signed! Thanks Miss Marly! Nachaele also gave a black shirt to match the pink one she has (Don’t have picture yet) and my friend Valerie made me a special bead bracelet. But mostly it reminded me how truly lucky I am to have such wonderful friends to help me get through this crappy cancer thing. There were way more people involved than I mentioned and I thank you as well. 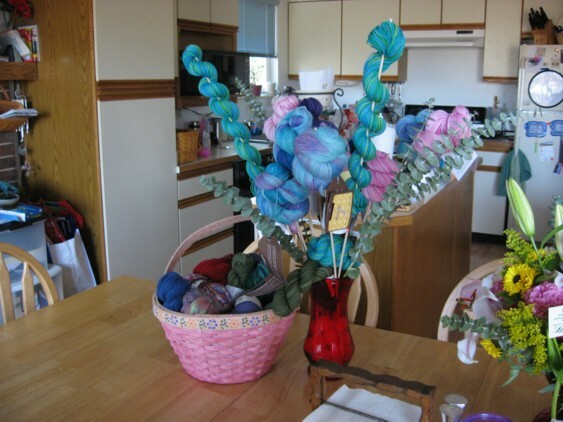 A woman’s wealth is not measured by how many yarn skeins she has (though it’s pretty darned cool) but instead by all the love and support from the people who gave them to her. Thank you so much. I’d say I was speechless, but you all know me too well. I’m never speechless. I am however so grateful for all of you. I can’t imagine what this would be like if I hadn’t met you. It’s been about a month since diagnosis so it’s time for everybody to do their self exams! I was trying to come up with a catchy phrase but “Feel Yourself Up Friday” was all I could think of. Too vulgar? Any ideas?